After nearly three years of promotion, which started at San Diego Comic-Con in 2008, the highly anticipated Tron: Legacy is finally hitting theaters on December 17th. A high-tech adventure set in a digital world that is unlike anything ever captured or seen on the big screen, the film is a father-son story at its heart. Sam Flynn (Garrett Hedlund) is a rebellious 27-year-old who is haunted by the mysterious disappearance of his father, Kevin (Jeff Bridges). The world’s leading tech visionary, Kevin was pulled into a digital grid where he’s been trapped for the last 20 years, and where his son also finds himself suddenly trapped. In order to escape and return to their own world, they must embark on a life-or-death journey across the landscape of the Grid, using weapons and vehicles to elude a ruthless villain named Clu, that was created by Kevin himself. In this exclusive phone interview with Collider, actor Garrett Hedlund talked about taking on his first leading role, his excitement for everyone getting to see all of the hard work that director Joseph Kosinski put into bringing Tron: Legacy to life and keeping Sam’s jacket as a memento of filming. He also talked about becoming a country musician for Country Strong (opening in limited release on December 22nd and in wide release on January 7th, 2011), co-starring Gwyneth Paltrow and Tim McGraw, and the experience of playing Dean Moriarty in On The Road, which is something of a dream project for him. Check out what he had to say after the jump. Finally, you can watch 15 minutes of behind the scenes footage from TRON: Legacy here, and here’s four clips from the movie. Collider: What are your emotions, now that this film is finally being seen by audiences? Are you excited, nervous or both? GARRETT HEDLUND: I’m excited for everybody to see the work that Joe Kosinski put into this, and Digital Domain and Darren [Gilford], the production designer, and Disney. It’s a long one in the making. For everybody to get to see Joseph Kosinski’s directorial debut, and have it be Tron: Legacy, I feel really fortunate to be a part of that, and I’m really proud of Joe and everybody involved. Was there a point when you realized that you were a part of something that held so much interest for so many people? Had you been aware of that from the beginning, or was there a moment where you realized the significance of it? HEDLUND: I was aware of the anticipation of it, just from seeing the VFX footage that was shown at Comic-Con three years ago and hearing the audience roar. 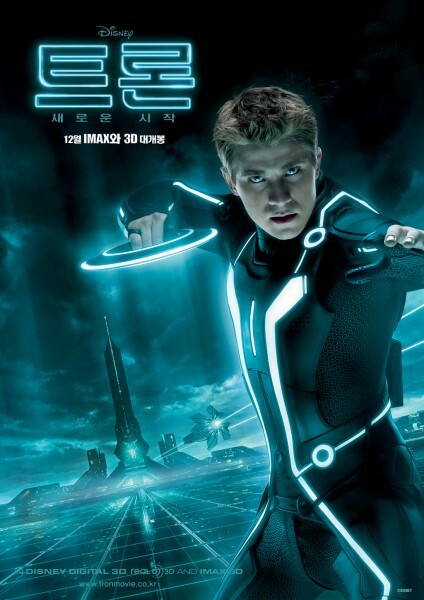 If it wasn’t for the fans of Tron, this wouldn’t have been a possibility. It’s really from their response. It’s really from their response. That’s why this film was made. I saw the anticipation way back then. You knew that the story had to be right, and you knew with Joe that the visuals would be outstanding. That was just the goal. Then, we had to overcome the obstacles to complete that. Did you get to take any props or things home from the set at all? HEDLUND: I think I kept Sam’s jacket. What ways were you most able to identify with Sam Flynn, and was there anything that helped you really key into who this guy was? HEDLUND: You look at what interests a person and then you formulate what their opinions are, in terms of how they see the world, and how they see love and life. That was the approach to this. There was a lot of training, in terms of the capoeira and parkour, the choreography for the fight sequences, the training for the suits, getting scanned into the computer and riding the motorcycle. All these qualities lent themselves to that. Then, you’ve just gotta think of a kid that’s really affected by the disappearance of his father and the abandonment issues that brings, and arriving in a world of complete unknown, now trying to find his father and get out, and everything that’s along the way in that. With all the different types of training that you did, was there anything that you found particularly challenging? HEDLUND: They all are acquired over time, as long as you’re patient. They were all challenging just because, like with anything else, in terms of abilities, it takes time. That’s just inevitable. With the parkour, it took time to acquire the little mysterious muscles to have yourself leap over something with just your arms. Was there anything that was especially difficult to envision while you were shooting the stuff that takes place in the Grid? HEDLUND: That’s where Joe is such an incredible director. He was always 10 steps ahead of us. He would explain what you were looking at with such detail that you were actually seeing it. That’s where Joe deserves his grand applause. He just had such a great vision. He knew exactly what he was going to do. I giggle about it now. If you have stress, it’s the self-imposed stress that you put on yourself, over what you want to accomplish. I laugh, thinking that he knew, all this time, what he was doing, so I don’t know why I put so much stress on myself about it. This is really an all-encompassing film, with dramatic and comedic elements, stunts and physical work, and green screen and effects. Is there something that you’ll take away from the experience of making this film, that you’ll be able to apply to future acting work? Had you been a fan of country music, prior to making Country Strong? HEDLUND: I grew up on the farm in Minnesota, so all we had was country music, but I never sang it or played the guitar before. Country Strong really means a lot to me just because, as soon as I finished Tron, I immediately started guitar training. I started in August, and we didn’t start filming until January 11th, so I had worked four or five days a week, every day, with the guitar. And then, finally, I was able to sing and play at the same time. Then, we went into the studio and put a couple of songs down, and went back a few weeks later to chart the progress. There was always progression. Things that weren’t coordinated started to come a little more naturally. I moved out to Nashville a month and a half early to live on Tim McGraw’s ranch. I just sat in front of the fireplace and played the guitar, and tried to work to appeal to Nashville and not let them down. One of the guys that was teaching me guitar out of Nashville had said, “You’re not going to be another one of those guys that’s up there while we’re here in a scene, and you’re playing a G, or you’re not even playing a chord at all.” Then, it’s a lot of pressure to not let Nashville down. I didn’t want to be some fool up there, playing the wrong chord, so I had to learn this stuff to its fullest. I started singing, down at certain little bars. That life sucked me in. How has the experience making On The Road been? HEDLUND: It’s incredible. We’re still filming it, so it’s hard for me to be able to talk about it from a distance yet, but everything has been great. I’m very proud of everything and everyone. Everyone is working so incredibly hard. That’s all you can hope for. Since that was something you had wanted to be a part of for a long time, how has the reality of making it lived up to what you had built it up as? HEDLUND: Oh, it’s surreal. There’s a part of me that just feels so incredibly fortunate to be a part of this, so lucky and so blessed. That’s all I can really say now. I’m speechless. Are you just working for the script, or are you also improvising? HEDLUND: Well, we have the blessing of the scroll version of On The Road, which is lengthier, more gritty and more honest, mixed with the directions of Walter Salles, who is just incredible. He allows the improvisation to be a part of it, whenever it wants to knock on the door. Who is the character that you’re playing in the film? HEDLUND: I’m playing Dean Moriarity, who is Neal Cassady in real life. He inspired a lot of these guys. He inspired Jack Kerouac and Allen Ginsberg. He was the secret hero of a lot of these guys. He’s just incredibly complex. He was inspired by every aspect of life and wasn’t afraid to verbalize it at all. With all the merchandising for Tron, what’s it like to be an action figure and see yourself on so much stuff? Is it easy for you to just stay grounded and focused on your career, even with all of that? HEDLUND: Yeah. I don’t even think about the action figures or anything, but I know they’re out there. I have one that they gave me at Comic-Con, but it’s at home, back in L.A. I don’t know. I don’t feel it makes me a better person or a worse person. It’s cool, but that’s all it really is.